The diagram below, produced by the Medical Officer of Health in Rhondda, shows the way in which – it was believed – smallpox spread from the original case (Margaret Mansfield, nee Evans). 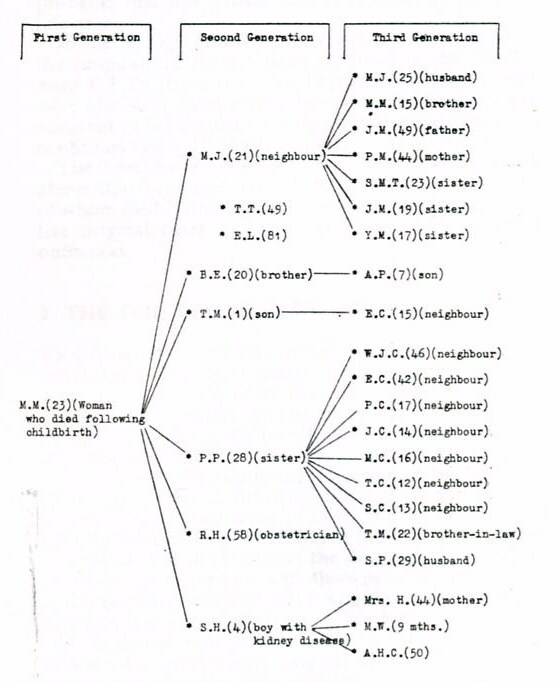 On the basis of reports in the press at the time and further research, names can be put to many of the cases in the diagram. There would appear to be some errors of names, ages or relationship in the diagram. Extract from the report ‘Smallpox: the South Wales outbreak, 1962’ by R. B. Morley-Davies, Medical Officer of Health, Rhondda. The case under First Generation is that of Margaret Mansfield (nee Evans), who died at East Glamorgan Hospital on 9 February 1962. Under Second Generation the first case is Marion Jones (nee Meacock, aged 21). The cases linked to her (Third Generation) are: Malcolm Jones (her husband), Michael Meacock (her brother), Joseph Meacock (her father), Peggy Meacock (her mother), Shirley May Thomas (nee Meacock, her sister) and two other sisters (Joyce and Yvonne Meacock). The Second Generation case B.E. was Brian Evans, Margaret Mansfield’s brother. A.P. (aged 7), identified as his son is probably Alan Pugh, son of Patricia Pugh (see below), whose other son Wayne also contracted smallpox (but is not shown on this diagram). T.M. (aged 1) is Margaret Mansfield’s first child, Terence. His father (also Terence) is shown as a Third Generation case linked to Patricia Pugh (P.P., Margaret Mansfield’s sister, whose age was elsewhere reported to be 24 and who died on 5 March 1962). The other Second Generation cases are Robert Hodkinson, the doctor from East Glamorgan Hospital (who died on 6 March 1962) and Stephen Howells (4) from Trealaw, who was believed to have contracted smallpox in the operating theatre at the hospital where Margaret Mansfield died. The final three cases in the Third Generation are Mary Doreen Howells (44), Stephen’s mother, who died on 20 March 1962; Melanie Williams (aged nine months), from Edmundstown, who had also been a patient at East Glamorgan Hospital and who died on 11 March 1962; and 50-year-old Albert Herbert Cook, from Gilfach Goch, who fell ill with smallpox after being discharged from the hospital. See: The Rhondda, Llantrisant & Tonyrefail Cases in Documents.